Husband and wife consulting with a architect inside a home under construction. Sometimes the only way to get the house you want is to build it. Our construction loans enable you to build the house of your dreams. We make it fast and easy to keep your project moving forward, and our loans are set up on a term that gives you the time to build just the way you want. A construction loan is a line of credit that enables you to pay-as-you-go through the process of building your home. It is underwritten to last for only the length of time it takes to construct the home. Think of it as a giant credit card you can use to pay for construction expenses. Until you make your first draw on the credit line, your balance is zero and you owe nothing. After you make draw requests to pay your builder, you will only have to pay the interest on the new balance. 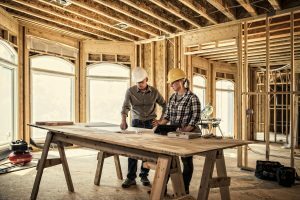 Once construction is complete, you will need a mortgage to pay off the construction loan and finance the debt over a period of time that works best for you.